Abdülmecid I (Ottoman Turkish: عبد المجيد اول ‘Abdü’l-Mecīd-i evvel; 23/25 April 1823 – 25 June 1861), also known as Abdulmejid and similar spellings, was the 31st Sultan of the Ottoman Empire and succeeded his father Mahmud II on 2 July 1839. His reign was notable for the rise of nationalist movements within the empire's territories. Abdülmecid wanted to encourage Ottomanism among the secessionist subject nations and stop the rise of nationalist movements within the empire, but failed to succeed despite trying to integrate non-Muslims and non-Turks more thoroughly into Ottoman society with new laws and reforms. He tried to forge alliances with the major powers of Western Europe, namely the United Kingdom and France, who fought alongside the Ottoman Empire in the Crimean War against Russia. In the following Congress of Paris on 30 March 1856, the Ottoman Empire was officially included among the European family of nations. Abdülmecid's biggest achievement was the announcement and application of the Tanzimat (Reorganization) reforms which were prepared by his father and effectively started the modernization of the Ottoman Empire in 1839. 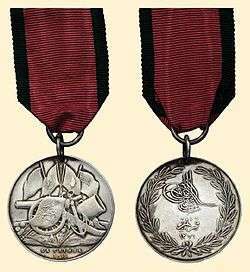 For this achievement, one of the Imperial anthems of the Ottoman Empire, the March of Abdülmecid, was named after him. During the reign of Abdülmecid, besides European style architecture and European style clothing adopted by the court, the Ottoman educational system was also mainly based on the European model. Abdülmecid was born at the Beşiktaş Sahil Palace or at the Topkapı Palace, both in Constantinople. 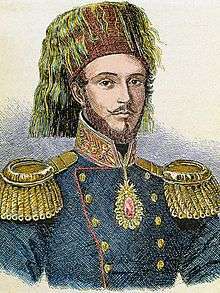 His mother was his father's first wife in 1839, Valide Sultan Bezmiâlem, originally named Suzi (1807–1852), either a Circassian or Georgian slave. Abdülmecid received a European education and spoke fluent French, the first sultan to do so. Like Abdülaziz who succeeded him, he was interested in literature and classical music. Like his father Mahmud II, he was an advocate of reforms and was lucky enough to have the support of progressive viziers such as Mustafa Reşit Pasha, Mehmet Emin Ali Paşa and Fuat Pasha. Throughout his reign he had to struggle against conservatives who opposed his reforms. Abdülmecid was also the first sultan to directly listen to the public's complaints on special reception days, which were usually held every Friday without any middlemen. Abdülmecid toured the empire's territories to see in person how the Tanzimat reforms were being applied. He travelled to İzmit, Mudanya, Bursa, Gallipoli, Çanakkale, Lemnos, Lesbos and Chios in 1844 and toured the Balkan provinces in 1846. When Abdülmecid succeeded to the throne, the affairs of the Ottoman Empire were in a critical state. At the time his father died, the news reached Istanbul that the empire's army had been defeated at Nizip by the army of the rebel Egyptian viceroy, Muhammad Ali. At the same time, the empire's fleet was on its way to Alexandria, where it was handed over to Muhammad Ali by its commander Ahmed Fevzi Pasha, on the pretext that the young sultan's advisers had sided with Russia. However, through the intervention of the European powers, Muhammad Ali was obliged to come to terms, and the Ottoman Empire was saved from further attacks while its territories in Syria, Lebanon and Palestine were restored. The terms were finalised at the Convention of London (1840). Dolmabahçe Palace, the first European-style palace in Istanbul, was built by Abdülmecid between 1843 and 1856, at a cost of five million Ottoman gold pounds, the equivalent of 35 tons of gold. 14 tons of gold was used to adorn the interior ceiling of the palace. The world's largest Bohemian crystal chandelier, a gift from Queen Victoria, is in the centre hall. The palace has the largest collection of Bohemian and Baccarat crystal chandeliers in the world, and even the staircases are made of Baccarat crystal. In compliance with his father's express instructions, Abdülmecid immediately carried out the reforms to which Mahmud II had devoted himself. In November 1839 an edict known as the Hatt-ı Şerif of Gülhane, also known as Tanzimat Fermanı was proclaimed, consolidating and enforcing these reforms. 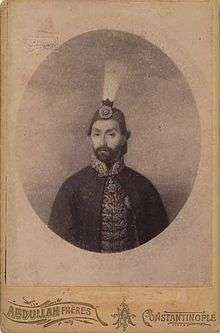 The edict was supplemented at the close of the Crimean War by a similar statute issued in February 1856, named the Hatt-ı Hümayun. By these enactments it was provided that all classes of the sultan's subjects should have their lives and property protected; that taxes should be fairly imposed and justice impartially administered; and that all should have full religious liberty and equal civil rights. The scheme met with strong opposition from the Muslim governing classes and the ulema, or religious authorities, and was only partially implemented, especially in the remoter parts of the empire. More than one conspiracy was formed against the sultan's life on account of it. 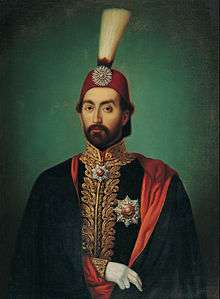 Another notable reform was that the turban was officially outlawed for the first time during Abdülmecid's reign, in favour of the fez. European fashions were also adopted by the Court. (The fez would be banned in 1925 by the same Republican National Assembly that abolished the sultanate and proclaimed the Turkish Republic in 1923). 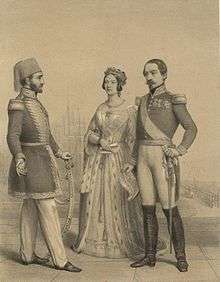 Sultan Abdülmecid (left) with Queen Victoria of the United Kingdom and President Napoleon III of France. Samuel Morse received his first ever patent for the telegraph in 1847, at the old Beylerbeyi Palace (the present Beylerbeyi Palace was built in 1861–1865 on the same location) in Istanbul, which was issued by Sultan Abdülmecid who personally tested the new invention. The Ottoman Empire received the first of its foreign loans on 25 August 1854 during the Crimean War. This major foreign loan was followed by those of 1855, 1858 and 1860, which culminated in default and led to the alienation of European sympathy from the Ottoman Empire and indirectly to the later dethronement and death of Abdülmecid's brother Abdülâziz. Abdülmecid died of tuberculosis (like his father) at the age of 38 on 25 June 1861 in Istanbul, where he was buried, and was succeeded by his brother Abdülâziz. Abdülmecid in his youth, by David Wilkie, 1840. Circassian (of the Kabardian tribe) HIM Empress Servetseza Kadın (c. 1825, Maykop, Russia – 24 September 1878 Istanbul), married in Istanbul, Topkapı Palace, in 1839, daughter of Prince Mansur Bey Temruko and Princess Fülane Hanım Dadeşkeliani, without issue. HIH Princess Behiye Sultan (22 February 1841 – 3 June 1847). HIH Princess Münire Sultan (Topkapı Palace, Istanbul, 9 December 1844 – Istanbul, 29 June 1862). Circassian (of the Ubykh tribe) HIM Empress Perestu Kadın (née Rahime Gogen, c. 1830, Sochi, Russia – Maçka, Istanbul), married in Istanbul, Topkapı Palace, in 1844, daughter of Gök Bey Gogen, without issue. Abkhazian HIM Empress Navekmisal Hanım (c. 1838, North Caucasus – 5 August 1854, Istanbul), married in Istanbul, Topkapı Palace, in 1853, daughter of Prince Rustem Bey Biberd and Princess Fatma Hanım Kızılbek, without issue. The türbe of Abdülmecid is located inside the Yavuz Selim Mosque in Fatih, Istanbul. 1 2 3 4 5 6 7 8 9 10 11 12 Hoiberg, Dale H., ed. (2010). "Abdulmecid I". Encyclopedia Britannica. I: A-ak Bayes (15th ed.). Chicago, IL: Encyclopedia Britannica Inc. p. 22. ISBN 978-1-59339-837-8. ↑ "Putnam's Monthly Magazine of American Literature, Science and Art Volume 0005 Issue 30 (June 1855)". ↑ Bezmiâlem Valide Sultan, Bezmiâlem Vakıf Üniversitesi Tıp Fakültesi Hastanesi Archived June 6, 2012, at the Wayback Machine. 1 2 3 4 One or more of the preceding sentences incorporates text from a publication now in the public domain: Chisholm, Hugh, ed. (1911). "Abd-ul-Mejid". Encyclopædia Britannica. 1 (11th ed.). Cambridge University Press. pp. 36–37. 1 2 "Measuring Worth - Purchase Power of the Pound". ↑ Kazi, Tehmina (7 October 2011). "The Ottoman empire's secular history undermines sharia claims - Tehmina Kazi". ↑ Istanbul City Guide: Beylerbeyi Palace Archived October 10, 2007, at the Wayback Machine. 1 2 3 4 5 Harun Açba (2007). Kadın efendiler: 1839-1924. Profil. ISBN 978-9-759-96109-1. ↑ Açba, Harun (2007). "Bölüm 2: Sultan I. Abdülhamid Han Ailesi". Kadınefendiler: Son Dönem Osmanlı Padişah Eşleri (in Turkish) (1 ed.). Istanbul: Prolil Yayıncılık. p. 28. Retrieved 24 Apr 2016. ↑ Açba, Harun (2007). "Bölüm 2: Sultan I. Abdülhamid Han Ailesi". Kadınefendiler: Son Dönem Osmanlı Padişah Eşleri (in Turkish) (1 ed.). Istanbul: Prolil Yayıncılık. p. 36. Retrieved 24 Apr 2016. ↑ "The Bellini Card". 18 January 2013. "Abdul-Medjid". Collier's New Encyclopedia. 1921.